Execute multiple Find/change queries at a click of a button! 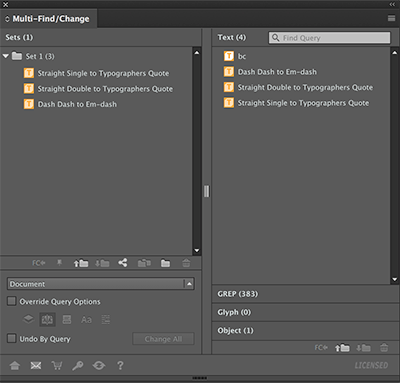 Multi-Find/Change (MFC) is an Extension for Adobe InDesign and InCopy CC 2017, 2018 & 2019 to manage and execute batches of saved Find/Change queries. MFC is the ideal tool for those who rely on Find/Change queries to correct and/or format text. What's New in MFC 3.0? Search fields to quickly find queries. Execute individual shared queries or shared sub-sets. If you have bought Multi-Find/Change 2.0, you are eligible to buy Multi-Find/Change 3.0 for $24.95. Multi-Find/Change 1.0 users will pay full price to go to Multi-Find/Change 3.0. You will need your serial number and order number to create a coupon code that will give you 50% discount over the price of a full product ($49.95). If you have lost your serial number and/or your order number you can retrieve them from your order history at eSellerate After-Purchase Services or contact support@automatication.com. Enter your serial and order number below and get your coupon code. Copy the coupon code and paste it in the "Coupon code" field in the Multi-Find/Change 3.0 Order Form. Any problem contact support@automatication.com. MFC allows you to organize Find/Change queries into Sets (lists). Easy to use, the user interface enables drag and drop of different types of Find/Change queries into Sets. Rather than executing individual Find/Change queries, MFC gives you the ability to perform Multiple Find/Change queries in a single operation. As a safeguard, it supports undo “Change All” to undo all the changes or undo by individual Find/Change query. MFC has the ability to allow workgroups to share Sets and Find/Change queries. Sets and Find/Change queries can be exported into self–contained files (xml) for other users to import or share. MFC complements the Adobe InDesign (or InCopy) Find/Change Editor, by adding simple one-step Rename and description properties to Find/Change queries, as well as providing an easier way to delete Find/Change queries. To update MFC to the latest version, download the trial version (even if you have a licensed vervsion) and follow the installation instructions. • Version 3.0.0 - Initial release (09/01/2016). • Version 3.0.1 - Bug fixes (18/10/2017). • Version 3.0.2 - Bug fixes (17/11/2017). Fixes the Find/Change list feature, improves support for diacritical characters in query names and removes escaped characters from the set comments. The trial version of MFC is a fully functional version with no time limit. The only limitation is that you can execute only the top two Find/Change queries from a set or selection. MFC is platform independent; the same software will run on Adobe InDesign or InCopy CC 2017, 2018 & 2019 on MacOS or Windows. You can purchase MFC directly from our Web store. After purchasing MFC you will receive an email with the receipt of your purchase that will also include a serial number and the software download link. The serial number will be used to unlock the limitations of the trial version. The version of MFC you are using. The version of Adobe InDesign (or InCopy) where MFC is installed. Do not use Adobe Extension Manager to install the Multi-Find/Change 3.0. Unfortuntely Adobe Extension Manager has been discontinued and no longer works with CC 2017, 2018 & 2019 apps. 6 - Drag and drop MultiFindChange3.zxp onto Anastasiy ExtensionManager main window. Wait for the installation to be completed (it might take a few minutes). 6 - Expand (unzip) MultiFindChang3.zip, it should create a new folder under the extensions folder. 12- Expand (unzip) MultiFindChang3.zip, it should create a new folder under the extensions folder. • Click Security & Privacy. • Click the Privacy Tab. 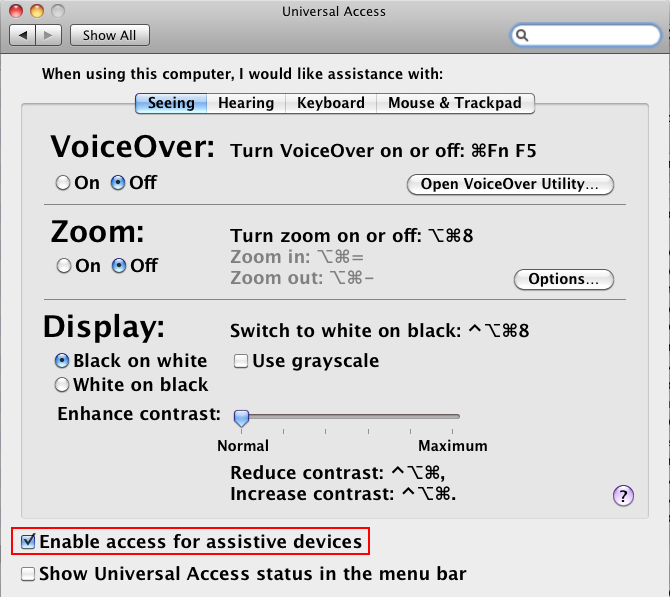 • Click the Accessibility section. • Click the Lock button in the bottom left-hand corner and enter your administrator password if required. 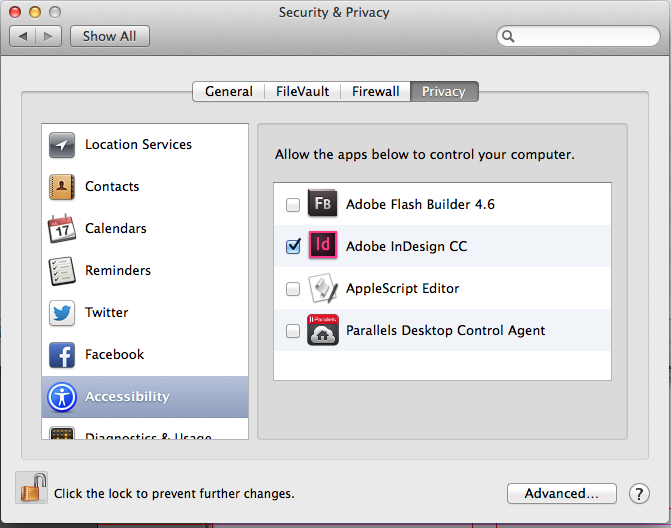 • Check the box next to ADobe InDesign. You must restart Adobe InDesign for the changes to take effect. 1 - Quit Adobe InDesign (or InCopy) CC 2017/2018/2019. 5 - Select Adobe InDesign CC 2017/2018/2019 on the Adobe Products list. After purchasing MFC through our Web store you need to activate the plug-in using the serial number you will receive via email. You should keep the serial number in case you ever need to re-activate MFC (if you change computers, or reinstall the operating system, for example). To activate MFC you need to enter the serial number in the trial version of the software. The trial version will become a full working version. The trial version can be downloaded from this page. If you have ordered multiple copies in a single order, you will receive a single serial number that will activate as many copies you have purchased. The license is computer based, which means that you can activate Adobe InDesign and InCopy CC if they are installed in the same computer. After purchasing MFC, you will need to wait about 20 minutes for the activation servers to be update. You might get the error message "Unknown Serial Number" if the activation servers are not updated. 1 - Start Adobe InDesign (or InCopy). 2 - Choose Window > Multi-Find/Change, to show the panel. When MFC is successfully activated, the serial number is displayed in the lower right corner of the panel. If you have activated MFC and want to move the license to another computer, you need to deactivate MFC. 2 - Choose Window > Multi-Find/Change, to show the MFC panel. Once MFC has been successfully deactivated, it will default to trial mode ("Trial Version" will appear on the lower right corner of the MFC panel). 1 - When Multi-Find/Change panel is re-opened, it will take a few seconds reload. We strongly advise that you minimize the panel rather than closing it. 2 - When opening the panel, reinstate the user selection might fail.